In the 1970s the New Zealand Government’s Forest Service’s priority on Arapawa Island became the protection of the native fauna and flora on Arapawa Island’s reserve, and started to perform a regular culling of the goats. This lead almost to the eradication of the goats. It was only through the dedication of Betty Rowe, a resident of Arapawa Island, that some survived. 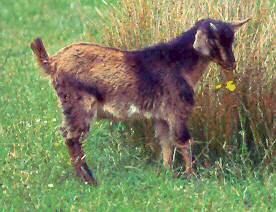 In 2004 six goats were brought from Arapawa Island to the UK to preserve the bloodline. Also many goats live today in a sanctuary set up on the island. From the original six goats brought to the UK there are now herds being built up around the country. In 2009 the first Arapawa Goat doe was brought to Mid Wales and in 2010 the first Arapawa buck arrived.